Enjoy the serenity and beauty of a crystal clear lake in the Northeast Kingdom of Vermont. Excellent fishing, swimming, boating, hiking, cycling, kayaking, and golf. Completely renovated home with modern conveniences. 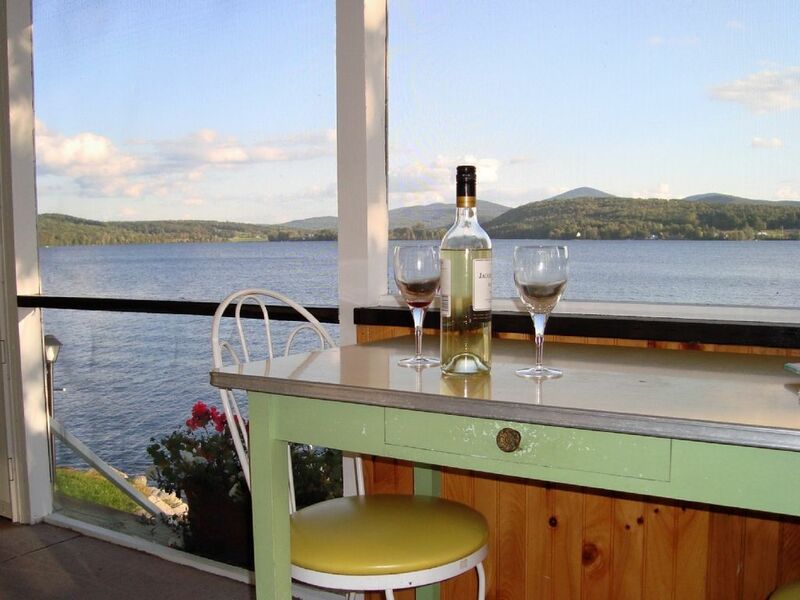 The screened porch offers splendid views of the majestic mountains surrounding Echo Lake. Ten feet from the water's edge with dock and rowboat. Thirteen miles from the Canadian border and the Eastern Townships. Fifteen miles to the international lake, Lake Memphremagog. Great spot on the lake. Brilliant sunset and moonrise. We are happy that you enjoyed your stay and will welcome your return. I've never seen such a beautiful, crystal clear lake and I've been all over New England. The lake front house is extremely charming. The lake and dock are literally 20ft from the beautiful screened in porch. I HIGHLY recommend this rental. The owners were very hospitable. They gave us all the privacy we needed. This is rental is definitely secluded. The road around the lake is a great place to walk and bicycle. The view from the house is breathtaking. The lake is perfect for swimming, boating, and fishing. The loons singing on the lake made it all the more magical. There is a little town about 10 minutes away with a few restaurants and places to get groceries. It's about 30 minutes from Newport. If you are looking for a place to unwind, relax, and "get away from it all"..this is certainly your best bet! I would give it 100 stars if I could. Thank you for your review. We are happy that you were able to enjoy our cottage and we appreciate your care of our place. Loved our stay! Charming home right on the lake. Charming home right on the lake. Peaceful and friendly neighbors. Frank and Sue were very attentive to our needs and questions. We are happy you enjoyed your stay and appreciate your care of our cottage. My family stayed here for a beautiful, quiet week of total rest and relaxation. We have gone to the Northeast Kingdom for four years in a row and this house was our favorite. The house is a classic, lakeside home. The screened porch catches the beautiful lake breezes and the first floor living room is larger than the photo shows. We are cyclists and the gravel and sand road around the lake is quiet and good for a short circuit. Echo lake is clean, pretty and our two young kids loved swimming every day after camp. There is dairy farm down the road which adds to the Vermont feel of this place. It was a truly memorable week of family R&R. Many lakes, streams and mountains to enjoy. Great roads for cycling. Beautiful golf courses in the US and nearby Canada. Several summer theater programs at nearby Haskell Opera House. Many artisan shops and shows.